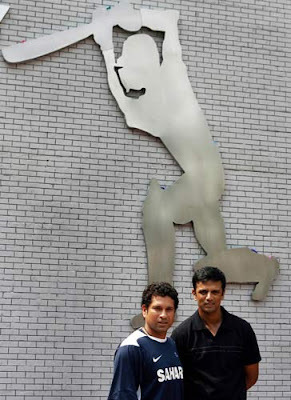 Sachin Tendulkar unveils an image in the honor of Rahul Dravid's 10,000 runs in both Test and One Day International matches. Unveiling the Wall, the master blaster said Rahul Dravid truly deserved such recognition and would remain a testimony for all his achievements. "It is a great credit to his family. More than a great cricketer and a great batsman, Rahul is a perfect gentleman on and off the field. The Wall will inspire every budding cricketer to emulate Rahul and his batting skills,"
"Dravid is ranked along with former legendary cricket Gundappa Vishwanath and former Indian badminton champion Prakash Padukone who also hail from Karnataka. By scoring 10,000 plus runs in both forms of cricket. Dravid is counted among the world's top six legendary batsman, including Sachin Tendulkar, Sunil Gavaskar, Steve Waugh, Brian Lara and Allan Border"
rahul is the best player.he was never jealous of sachin or anyothers.none can match his greatness. rahul dravid is one of the gtreatest cricket players in the world , we cant compare him with any other cricketer,he is only one of his kind best known for his class, commitement and consistency.Even if we consider sachin as a god in cricket world , yet we need to consider rahul as another they all teach us the same, the CRICKET,class, descency. Wall is a master-piece.. Probably the best technique in world cricket.. He deserves much more than this.. You cannot compare him with Sachin Tendulkar, they have their own batting style.. But one has to say that it's because of Dravid, India has won numerous matches outside India.. And as far as the declaration in Multan is considered, it was a joint decision from John Wright, Ganguly and Dravid!! He was never jealous.. He is a gentleman and will ever be..